I can’t help but notice how much it’s being discussed in magazines, editorials and on TV. -Grown professionals in well made suits discussing what Prince George’s first word might be on breakfast TV. Nodding and shaking their heads in serious debate. Generally (in my personal experience) a child’s first word is most likely to be the first of a long line of single syllable nouns to which you have to reply “yes, That’s right darling” – Bus. Cat. Dog. Car. Ball. Mine. No. etc ..So no rush, that’s what I say. If I was the Duchess of Cambridge, however, this little pearl would have to be my favourite. 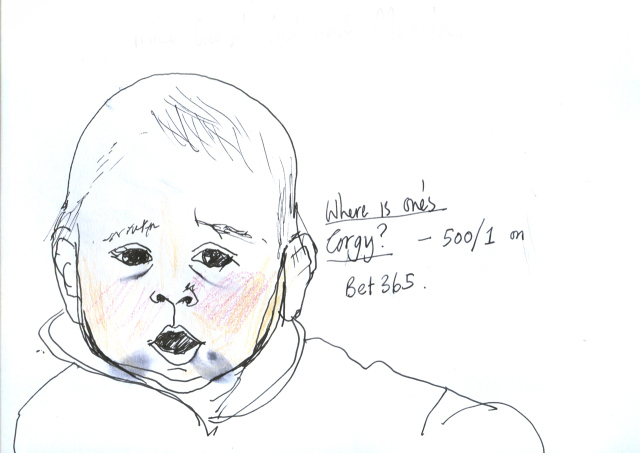 This entry was posted in opinion and tagged bet365, betting, Duchess of cambridge, First Word, humour, illustration, Laura Quick, Prince George, Prince George's first word, Royal Baby, satire, Speculation. Bookmark the permalink.